Trevor and Oprah seem to be bumping into each other more and more often these days. A few months after he appeared as a guest on her Super Soul podcast, the two shared a stage at the Global Citizen Festival in Johannesburg and this week, the television personalities reunited. This time, it was Trevor asking all the questions and Oprah, for a change, had the privilege of being an interview guest on someone else’s show. Their interview was engaging; funny at times, sincere at others, and by the time it came to an end, Trevor’s fans didn’t want her to leave (as you’ll see in the clip below), such was the impression she left on her audience. Their discussion touched on a number of projects including her new book, The Path Made Clear, her television project with Prince Harry and her true calling. During one of the lighter portions of the interview, Oprah revealed that she has a deep and sincere love of avocados! She told Trevor that she grows her own and travels with them everywhere. She said to the comedian, “I travel with my own bread and I bring my own avocados. So I have my own avocado orchard”. The chemistry between the duo was unmatched and we can safely say this will go down as one of Trevor’s finest interviews to date. 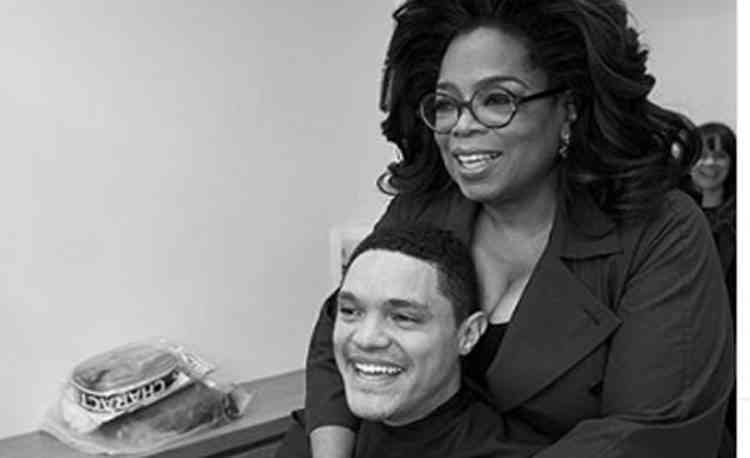 Perhaps the reason that Oprah was able to warm up to Trevor Noah so much is because of the gift he arranged for her to collect backstage before their interview began.